Are you tired of trying out dozens of SEO strategies, buying tons of different organic SEO services that promised guaranteed Google first page rankings and praying to Google Gods? Well, you are in luck – your search is over. Just follow this simple 7 step process & rank on the first page for keywords that will bring you traffic & Sales. Knowing how strong your website’s authority is crucial. It determines your whole SEO strategy. Your domain’s authority in the eyes of google determines which kind of keywords will bring the most traffic to your site. If your site has high authority, you can go after difficult keywords which usually bring in more traffic whereas if your domain is not strong SEO wise, you should go after keywords which result in less traffic but are easier to rank for by a weak domain. Visit Moz.com Link explorer and create a free account. Enter your site Url in the explorer. Keyword research is the process of finding the right keywords which we can rank for easily to get targeted traffic. First of all, Come up with 15-20 to keywords that people might search for when looking for your product or service. Make sure you include both buyer intent and information intent keywords. Each keywords should be at least 3 words long. Now put these seed keywords into keywordshitter (Nice name, right). Hit run and let it run for around 2 minutes. 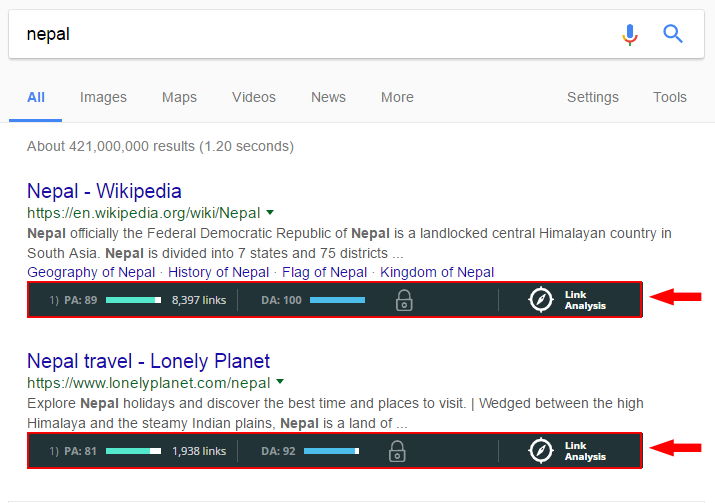 Next, go to searchvolume.io, select your target country and put the keywords generated by Keywordshitter, in the box to get their search volume. Export the list of keywords with search volume and open the file. Remove all the keywords which have too high search volume ( several thousands ) and too low SV (10-100). Keep trimming the list until you have a list of 20-30 keywords left. Finally, Install moz bar. Put each keyword into google search and analyse the results. If 2 or more website which are ranking on page one have a DA lower than yours (which you determined in the first step) and less 5 links to the pages, you have a good chance of ranking for that keyword. Repeat this step for all 20-30 keywords to see which keywords you should target. You should have a list of at least 5 keywords in the end. Once you have nailed down your top 5 keywords, you need to find out the search intent behind them. By deciphering the search intent, you will know what kind of content do you need to create in order to rank. Just put the keyword in google and hit enter. What kind of results are the most common out of the 10 shown by Google. Are they blog posts, videos, Product pages, pdf’s, images or something else? Informational intent – Someone looking for information. Example – How to email someone, what is an email. Navigational intent – Looking for a particular website. Example – Gmail Login, facebook signup. Transactional/Buyer Intent – Looking to buy something. Example – Buy webhosting, get insurance quotes. for transactional intent keywords, product/service pages, landing pages work the best. Navigational intent keywords only work for the site/company searchers are looking for. Even if you are able to rank for “Facebook”, you won’t get much traffic if any traffic, as almost all the traffic will click on facebook.com in the search results. Now that you have figured out what keywords to target and what kind of content to create for them, it is time to actually create it. Most likely its either one of these two – Blog post or Product/service page and for both of these content types, the same SEO optimization rules apply. Your url should always the main keyword you are targeting and should not be too long. For example, the keyword I am targeting is “Google first page guaranteed” therefore url looks like attentionalways.com/google-first-page-guaranteed/, many people use the entire title in the url. That makes the url too long so I suggest you don’t do that. Your main keywords should be in the title of your page/post. Since Google treats synonyms similarly, you can get away with using synonyms in the title but having something totally unrelated is a bad SEO practice. Modifiers like Best, top, cheapest, (current year) etc in the title helps you get additional traffic without additional effort. Many people add modifiers like these to your main keyword while searching online. This is not completely necessary to add modifiers but it is a nice and quick way to get more traffic. Although wordpress wraps title in H1 tag by default but many themes overwrite this. Check if this is the case with your site, and correct it. Using images and videos in your posts not only makes it look better but also increases the time a user spends on your site which is good for SEO. All your subheadings should be in H2 tag. Linking out to relevant external resources helps google determine the topic of your own page better and improves user experience as well. All the images you use should have an alt tag. Don’t leave it blank. Lately, Google has been preferring Longer content over shorter content. Aim for 1500 words on a page at least. For any type of page to get traffic, it needs to make to the front page of google. And unless you are a huge site with tons of authority, your page will be needing backlinks (sometimes tons of links) to get to the first page. Internal links are links from other pages on your site. These are the easiest to get however many people overlook this. An example of an internal link is this, where I am internal linking to my post about Email Outreach lessons that I learned after 5000 Link Building emails. The benefits of using internal links are two fold. Not only do internal links help your pages climb up google rankings, they also keep your site visitors on your site for longer which is another google ranking factor. External links (that is links from other sites) are like votes. The more votes you have, the higher your site ranks in google. Backlinks continue to be the strongest ranking factor in google. But they are hard to come by on their own. You need to make a link building strategy for your site and execute it to earn links. If you want to get started with link building, I would suggest starting with Guest posting which is one of the easiest link building tactics. Here is a step by step way to do it. Sidenote: Many people try to take shortcut and buy backlinks or outsource linkbuilding. There is nothing wrong with that, in fact, we offer custom link building campaigns too however I would suggest staying away from buying links from fiverr and similar platform especially the gigs that offer thousands of backlinks for 5 or 10 bucks. These links are spammy in nature and will get your site penalized from google. Next step is to start keeping a track of where your pages are ranking for their target keywords so that you can get real time feedback of your link building efforts. As you build links, optimize the content, increase your site speed or make any other changes to your site, the pages will either move up or stay at the same position thereby providing you with insights as to which activities are helping you the most SEO wise. By using the change in ranking positions as feedback, you can double down on activities that result in an increase in rankings and cut back on activities that give no or negative results. You can use Serptoday’s free plan to start tracking your rankings. Serptoday is especially useful to bloggers who are just starting out and dont have much money. After your page gets to page 1 for the target keyword, new ranking factors like Click through rate, dwell time, etc will kick in. These 2 things are what a searcher see before they decide to visit your page. Suppose you are on position 6 and you update your Title and meta description which is more compelling than the websites ranking above you. When Google sees more people are clicking on a page ranking on position 6 than higher ranking pages, it will promote your page higher. Dwell time is the time difference between when a user clicks on a search result and when they come back from the website to the search results. The longer they stay on their website, the better it is as Google sees a longer dwell time a signal for good user experience. By updating the page with up to date information on a regular basis, users are more satisfied with your content and stay on your site longer. As explained in the fifth point, building internal links helps increase the dwell time. By internal linking, you give readers something more to read about. In July 2018, Google rolled out the “speed update” which rewarded faster sites over their slower counterparts. This is how speed impacts your rankings directly. The indirect effect is through dwell time. If a user clicks on search result but your site takes too long to load and show the content hee came to see, he is very likely to click the back button which affects your dwell time. If the page is good looking and well designed, it is easier for the readers to consume whatever you have on the page. And if they find it easy to consume the content, they are more likely to stay on the page and read it till the end. There you have it – 7 simple steps to guaranteed ranking on google’s first page. Notice that I said simple and not easy because it is not easy to rank on google anymore. It requires a lot of consistent hard work to rank on google these days but the rewards make it all worthwhile. Here is a list of some digital marketing tools to make the process a bit easier for you! If you would like us to do the hard work for you, click here to book a free consultation call with us.